The timing of Thanksgiving — at the precipice of the darkest and coldest days of the year — turns out to be a helpful thing. Just when the speed of life picks up and the weather closes in, we have the chance to pause and frame it all in the context of gratitude. Our focus this week was inspired by a recent post by James Clear, one of my favorite bloggers. In it, he suggests that by changing one word, we can shift from being stressed to thankful, from harried to happy. Changing “I have to” to “I get to,” changes everything. It’s a wonderful, perspective-changing post and I hope you’ll read it. These days, what with building a business as an author and artist, and my husband building us a house and the holidays building in intensity, the list of things I want to accomplish every day is long. Sometimes when I look at everything that is asking for my attention, my head spins…and sometimes I get crabby and resentful. Recently, I’ve created a practice around my To Do List ~ espeicially when it’s got me feeling a little wobbly in the knees and tight in the heart. I practice looking at each item on the list in one of three ways: Self-Care, Service or Both. I’m finding that at least one of the categories works for everything. When I’m carving out time for my yoga practice, I remind myself that getting on my mat is an act of self-care. When I’m cleaning the cat box and filling her food bowl, I think of it as an act of service. When I’m planning healthy, whole-food, plant-based meals, I remind myself that the time and effort it takes is an act of self-care for me, and service to anyone I’m feeding. My favorite scenario is when I find a way for whativer I’m doing to be BOTH self-care and service. This morning, for example, when cleaning out the cat box, I squatted down in such a way as to stretch my hips and low back. Suddenly * BOOM *- the chore which I was doing in service to the Buddha cat ALSO became an act of self-care. We all have full and busy lives and this season tends to pick up speed, momentum… and stress. See if changing your language from “I have to” to “I get to” changes how your To Do List feels. And while you’re at it, you can experiment with making everything on that list an act of self-care, service…or both. Thank you, dear reader! I’m grateful for you. Happy Thanksgiving. When it comes right down to it, Matthew 25:40 is the litmus test for me. How a person, a company, a congregation, a country treats the least among them reveals everything about character. And while I can see how corrosive it is when others treat the powerless poorly, I don’t always recognize when I do it in myself. Treating my most vulnerable, least powerful parts with anger, callousness or by ignoring them is equally revelatory about me. Here are 4 ways of looking for and connecting with “the least of these” in yourself. First, give yourself a few minutes to get quiet. Sit comfortably somewhere where you can be undisturbed for a while and take a few breaths to let thinking and doing settle down. Scan your body and notice the part that is giving you the most sensation or presents itself as needing the most healing right now. It may be the place of a recent or past injury. It may be an illness or disease or where the repercussions of habitual movement gather. Whereever the place is, first notice how you feel and talk about it. Are you impatient or frustrated with it or do you ignore it? Then spend some time sensing this part of you directly without story or judgement. Simply notice the direct sensation without adding anything to it. Be open to feeling what it most needs. From there you can make a choice about how to respond. From the same quiet place, notice the lines of thought that feel difficult or that drain you in some way. Notice what Jason Mraz calls the “thoughts that do not make me strong” and which ones are predominant right now. You might be worried about something or angry about something. You might have a recurring cycle of thinking about your circumstances (or job or children) or you may have thoughts that circle around fruitlessly in an obsessive cul de sac. Then notice thoughts about those thoughts. Do you get exasperated with yourself for thinking like that or do you just buy into the thoughts and see them as true? Separate the thoughts from the thoughts-about-thoughts and inquire what the “thoughts that do not make me strong” need, what would ease them. Sometimes just paying attention and being kind to the worried or frightened part of you who is thinking this way can ease the relentless thought flow. Other times, realizing that it only hurts you to worry or stew in your own angry juices can help to disentangle from the “not strong” thinking. Not long ago, I was with a friend who was telling me about a difficult situation at home. With fire in her voice, she detailed the thoughtless things her partner had done and then she stopped abruptly and said, “I should just not get angry.” I wished for her and for all of us that when painful or vulnerable emotions come up that we can treat them gently and give them attention. Ignoring feelings only pushes them underground to resurface in unexpected and often unskillful ways. Giving them our awareness and tenderness can help get to the root of them and allow them to heal. When my spirit is hurt and limping along, I often can’t quite identify what’s happening. As Avicii sings, “I didn’t know I was lost.” This is what it feels like when I lose touch with awareness: I’m lost but I don’t know it. One way I can tap into how my spirit is faring is to ask myself about my aliveness: do I feel alive and engaged with my life and the world? I might well be angry or passionate or afraid of things that are happening but if I also feel alive, my spirit is likely doing fine. On the other side, my life might be fine on the surface with the kids’ lunches getting packed and the calendar full of events and the work getting done but if I also feel numb or disconnected or even dead inside, it’s likely that my spirt needs tending. Rather than poo-pooing the feelings, ask what would wake me up? What would help me feel more alive? Once I am more connected to my relationship with “the least of these” in myself, I can open my awareness to how that manifests in my relationships with others, and what groups I want to invest my energy in. When connecting with a community or business or political party, one question I always want to ask before I join them is, What do you do for the least among you? I’m no doctor or physical therapist, but when I wrote the Knee-Ahh post in 2013, I included 4 tips that I use in my own body and practice to take care of my knees. In the meantime, I’ve continued to explore resources and practices for knee health. Below are 5 more of my favorite keys to happy knees. One of the most common causes for knee pain and ultimately knee surgery is improper tracking of the knee cap or patella. Here is an excellent article that defines, explains and addresses knee tracking issues. It’s focused on yoga postures, but of course, it holds true no matter what you do. And here’s a shorter, more general article that is also helpful. The body is designed to be stacked along the mid-line so the structures of the feet, legs and spine can hold us in standing with ease. The truth is, though, most of us habitually hold our bodies out of that alignment which causes strains and stresses – and no where is this more true than in the knees. Many of us (including loose-ligamented me) tend to stand with locked knees. Check out these two (kinda goofy but sweet) physical therapists as they talk about proper and improper knee posture. In addition, notice how you place your feet when you walk and how you hold your feet when you stand. The first movement of The Nia Technique is the Heel Lead and for good reason. By leading with the heel when we step forward or to the side, not only are we protecting the joints and skin of the feet, but the knees automatically align properly. When you’re standing (or walking), do you turn your toes out or in? If you do, your knees (and hips) are being pulled out of alignment. Observe yourself with curiosity and stand and walk with the intention to heal. Whenever you have pain in your body, look to what’s happening above and below it. If you are experiencing knee pain, it’s likely that the muscles above (quadriceps and hamstrings) and below (calf and shin) are either weak or tight. I love this exercise (What’s not to love? It’s called Knee Dancing!) for strengthening the quad muscles without hyper-extending the knee. Similarly, muscles above and below points of pain can be over-tight and pulling on the knee joint. Stretching, particularly the calves, hamstrings and quads can offer relief to tender knees. I like these simple stretches for doing just that. – Dr. Christopher’s Comfrey Ointment – My herbalist friends swear by the healing properties of the external use of comfrey (which is also known as “knit bone”) and I’ve found it works wonders for me. – Biofreeze – which works particularly well for me as a pain reliever. – And Arnica, an herb which has been used for centuries as a healing salve. If you have other approaches to knee happiness, please share them in the comments below or on the Focus Pocus Facebook page. May you and your knees be happy, healthy and at ease! This was originally posted on April 28, 2013. Since my knees are feeling a little wonky lately, since we have new routines to bring the focus to, and since I was TED-consumed in the past few days*, I thought I’d bring this popular post back. There are many good resources for learning about knee health (for example, click here for a good article about knees and yoga), but we can learn particular things from the practice of Nia (click here for an article from the Nia White Belt Manual about Nia and the Knees and here’s another on Knee-Locking Syndrome). * Interested in checking out some of the TEDx Charlottesville talks that happened on Friday? You can see the whole day by going here http://livestream.com/tedx/events/4498792 . All the talks are aMAZing and are inspirational, thought-provoking, surprising and moving. If you’d like to see the speakers I’ve been working with for the past few months, you can find Elliott Woods at 6:19 and Leslie Blackhall at 6:48. 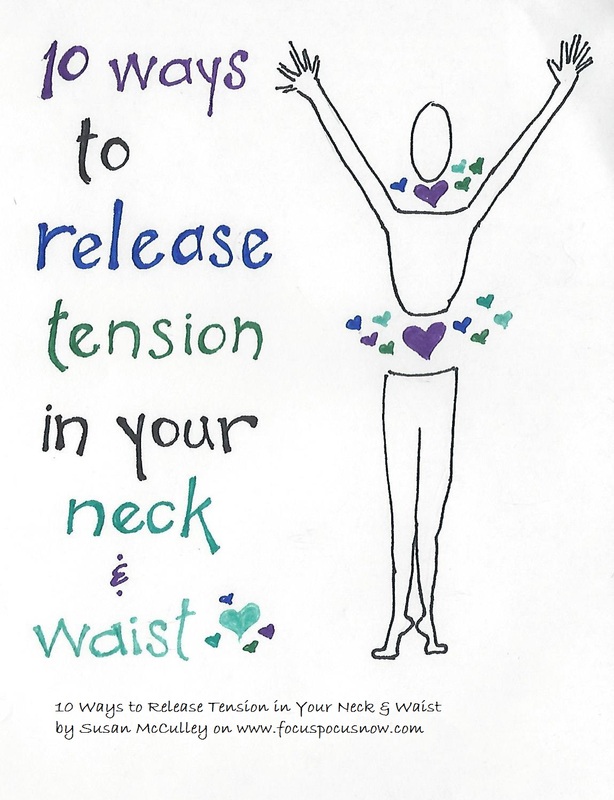 Earlier this week, I posted 10 Ways to Release Tension in Your Neck & Waist (thanks to all who shared it!) and today I’m offering 3 more simple, practical things you can do to create more ease in these always-supporting body parts. 1. Move Twice An Hour! Set a 30-minute timer at your desk. When it goes off, stand up, move around, stretch what needs stretching. 3. Move on the Floor! There are huge physical benefits to moving and stretching on the floor. While you’re watching TV or playing with your kids or pets, get on the floor and move around, paying particular attention to move your waist and neck. Use the support of the floor and your body’s weight to stretch in ways that you can’t while on your feet. BONUS: Five Stages! One of the best ways to stretch and strengthen your neck and waist is the Five Stages of Self-Healing. These five simple movements are the developmental movement we went through as children but rarely revisit as adults. You can follow along with this 5-minute video and get a whole body stretch and workout that is particularly good for your spine. Yesterday, I posted about the structure of the neck and waist and how chronic immobility in these areas creates weakness and tension. To restore balance and ease in the supporting areas of neck and waist, mobility and flexibility is key. Here are 10 easy ways to increase the health and happiness of your neck and waist. 1. After sitting at your computer for a while, open your eyes and look at each corner of the room. Bonus points for looking up at the actual sky. 2. Make big, slow back-stroke movements with your hand and follow your hands with your eyes (actively use your eyes rather than following your hand with your shoulders and chest). 3. When backing out of a parking space, look behind you with your eyes and neck rather than cranking your body around. 4. Imagine you’ve got an alligator or kangaroo tail and let your tailbone release and swing as you walk. Bonus points for doing this in the grocery store or even better in the bank. 5. Lie on the floor on your back with your feet flat and knees pointing to the ceiling. Imagine there is chalk under your low back and use your lumbar spine to “erase” the chalk. 7. Gently stretch your neck using the handy-dandy weight of your head – allow your ear to fall to your shoulder, then chin then other shoulder. As you drop your head to the right, use can gently place the weight of your left hand near your left collarbone to create more length and release. 8. Lying on the floor or a bed on your back, cradle the back of your head with your fingers and run your thumbs gently and firmly along the ridge between the back of your skull and your neck. There are lots of little muscles here that rarely get enough love. 9. Wrap your hands around your waist with your thumbs in back and your fingers in front and massage first your low back, then around to the sides of your core, gently squeezing any places that are tense or tight. 10. On all fours, with hands under shoulders and knees under hips, inhale and drop your belly while lifting your eyes and tailbone, then exhale and drop your head and tail while using your belly muscles to round your low back up. These poses are called Cat and Cow in yoga but you can also circle your hips, move your hips forward and back, and generally move your waist in this position to get a personalized delicious stretch. In this week of the fall equinox, where we celebrate the balance of our days, give some love to the supporting cast. Allow your waist and neck movement and release. COMMUNITY BONUS: Do you have any ways of creating movement and stretch in your neck and waist? Please share them in the comments below or on the Focus Pocus Facebook page!